I am not the kind of person who likes to put labels on things, because doing so often makes me feel restricted. Tell me something is gluten-free and I immediately assume I am missing out on a better version made with gluten. Call it vegetarian, and I will convince myself that whatever it is would have been better with sausage in it. I know it is semantics, but for me it is easier to avoid the perceived restrictiveness of diets by just cooking and eating what my mind wants and body craves, free of labels. Generally, the two are in alignment: After a night of too much partying, my mind wants pizza, and my body most definitely agrees. After yoga, my brain is thinking a salad is a pretty good idea, and my stomach is, too. Where things get tricky is around the holiday season, when my mind wants something comforting, nourishing, warm and satisfying. But my body, screaming for a green vegetable, simply cannot abide another chicken potpie or personal pan of lasagna. 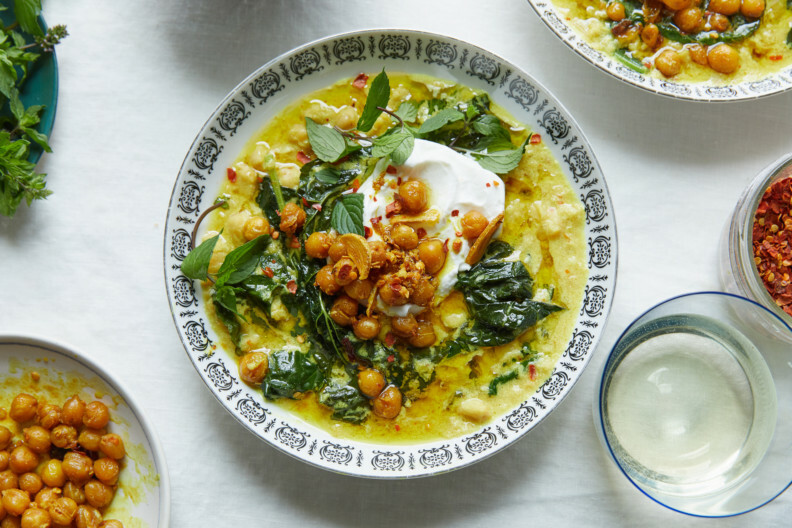 In this stew, chickpeas are crisped in a not-insignificant amount of olive oil with loads of fresh ginger and turmeric, then simmered in a bath of coconut milk (full-fat, please) until they are falling apart to the point of creaminess. Next, add as many dark, leafy greens as you can fit in the pot, cooking just long enough to get them bright and tender. If you are feeling especially indulgent, a dollop of tangy yoghurt and a tangle of fresh herbs are excellent additions. But I would never label this a vegetarian stew, lest we omnivores feel as if we are missing out on something. Just know that it is (and if you omit the optional yoghurt, vegan, too) and that, I promise, we are not. 1. Heat oil in a large pot over medium heat. Add garlic, onion and ginger. Season with salt and pepper and cook, stirring occasionally until onion is translucent and starts to brown a little around the edges, 3 to 5 minutes. 2. Add turmeric, red pepper flakes and chickpeas, and season with salt and pepper. Cook, stirring frequently, so the chickpeas sizzle and fry a bit in the spices and oil, until they have started to break down and get a little browned and crisp, 5 to 8 minutes. Remove about a cup of chickpeas and set aside for garnish. 4. Add greens and stir, making sure they are submerged in the liquid. Cook a few minutes so they wilt and soften, 3 to 7 minutes, depending on what you are using. (Swiss chard and spinach will wilt and soften much faster than kale or collard greens.) Season again with salt and pepper. 5. 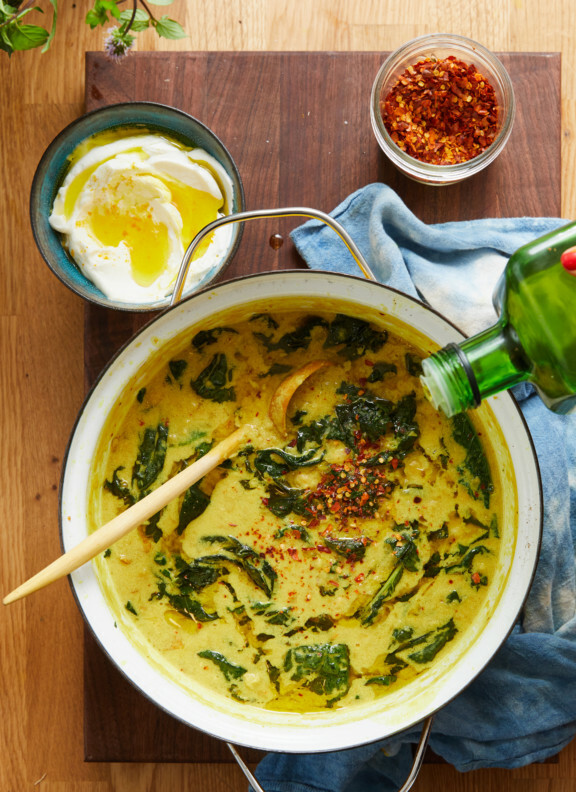 Divide among bowls and top with mint, reserved chickpeas, a sprinkle of red-pepper flakes and a good drizzle of olive oil. 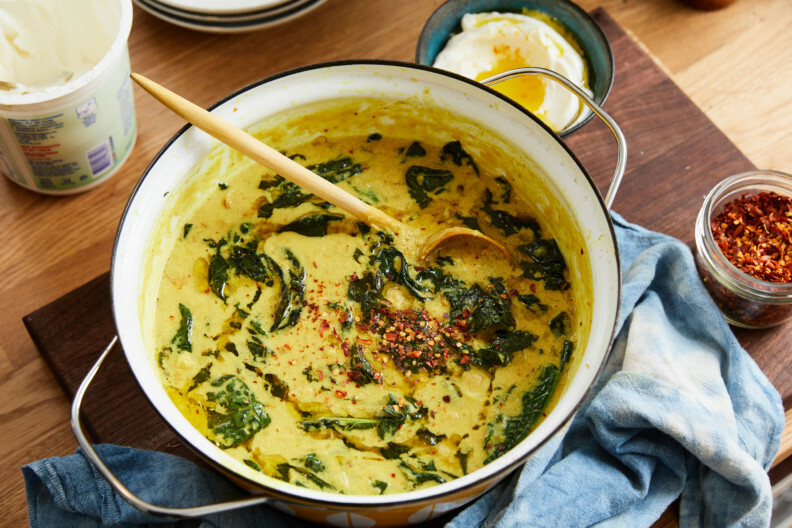 Serve alongside yogurt and toasted pita if using; dust the yogurt with turmeric if you would like.